Offering you a complete choice of products which include concrete block making machine, block making machine, solid block making machine and manual block making machine. Our company has established itself as a leading manufacturer and supplier of superior quality Concrete Block Making Machine in the market at present. 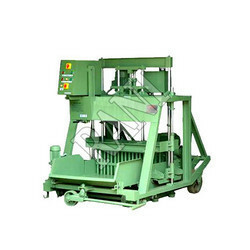 This machine is easy to operate and make good production of concrete block, hollow block, solid block and paver block can be made in this machine. All type of block measurement moulds can be designed based on customer’s requirement. These products have gained prominence due to their precise finish, high performance and reliability. Furthermore, these machines are competitively priced and used in construction industries. We are recognized as a successful manufacturers and suppliers of Block Making Machine in the market at the present scenario. This one from our side is a mechanical device to generate vibrations. The vibration is often generated by an electric motor with an unbalanced mass on its driveshaft. These are used extensively in the construction and building industries to move and position bulk material or small component parts. The application of vibration working with the force of gravity can often move materials through a process more effectively than other methods. As an ace manufacturer and supplier of Manual Hollow & Solid Block Making Machine, we have marked our name very strongly in the market. 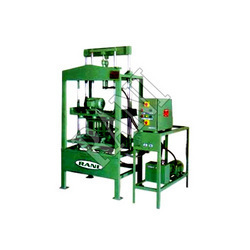 This machine from our side gives a superior production capacity yielding high number of blocks per stroke. The machine is of high quality and so the blocks produced in the machinery also come out to be very good on the quality aspect. The switches and connectors used in the panel board, valve and hydraulic hose have got a very strong infrastructural base. 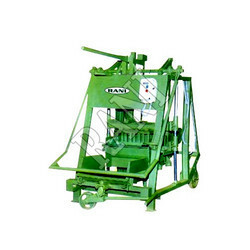 We are prominent manufacturer and supplier of Manual Block Making Machine used in construction and building. 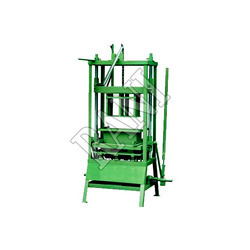 This Manual Block Making Machine is manufactured by using high grade material and innovative technology. These are manufactured at par with international quality standards, our range can be customized as per the specifications stated by the clients. Our clients can avail from us a wide range of Block Making Machine that is extensively used in varied industries for cutting pavements and concrete blocks. Provided with desirable cutting block height and 4-side cutting edge, our range stands high in quality and durability.